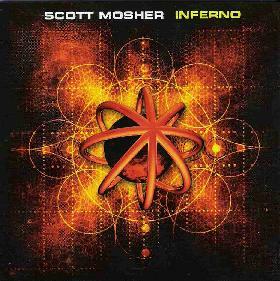 Scott Mosher's follow up to 2001's Virtuality album features more of his space-ambient metallic brand of progressive rock. The CD opens with a brief intro of storm building effects, rumbling drones and singing keyboard lines. But Scott quickly launches into the metallic title track, which is a heavy, pounding and highly intense slab of progressive rock. And as we're reeling from the impact of "Inferno", things calm momentarily for "Dark Sun", a keyboard heavy track that brings to mind Rush soaring deep into the cosmos. Yeah... this is the trademark Mosher sound that blends spacey ambience with the full blown majesty of progressive rock. Beautiful. "Mindfield" and "Look Into You" are both killer songs that takes the Rush-in-space sound to even greater heights. "Left Behind" is similar and has some ripping guitar work. "Engines Of Industry" is an instrumental that begins with crushing but intricate rock, and culminates in some of the most swooning moments of the set. Any long tracks? Sure, we've got a few. At 9 minutes, "Exile" really demonstrates what Scott can do when he takes some extra time to stretch out and explore. Monster keyboards create a grandiose prog laden environment around which the song is constructed. But when the instrumental segment takes off we are waaaaaay outside of Earth's orbit and sailing through the prog cosmos. "The World Fades To Gray" is the longest track of the set and probably the most atmospheric... though like nearly everything on this CD it still rocks... and when it takes off it rocks hard. Great guitars. "Season Of Fire" closes the set, being something of a floating space-prog Tangerine Dreamy techno number. In summary, if you dig Rush, Tangerine Dream, Space Rock and keyboard heavy Progressive Rock, then you'll surely enjoy Scott's music. He's really got a flair for the Space Ambient/Progressive Rock blend. He does an outstanding job of injecting a healthy dose of space into the heavy prog genre, creating music that is challenging but accessible, and maybe occupying a unique little stylistic corner of his own. For more information you can visit The Ambient Mind web site at: http://www.theambientmind.com. Contact via snail mail c/o Scott Mosher; 2 Miller Court; Miller Place, NY 11764.